Vadodara crime branch arrested 12 accused with IMFL worth 32 lakhs early morning on Sunday. The team also busted a new Modus operandi where the accused brought liquor boxes inside four wheelers loaded in the trailer truck to spoof the police. 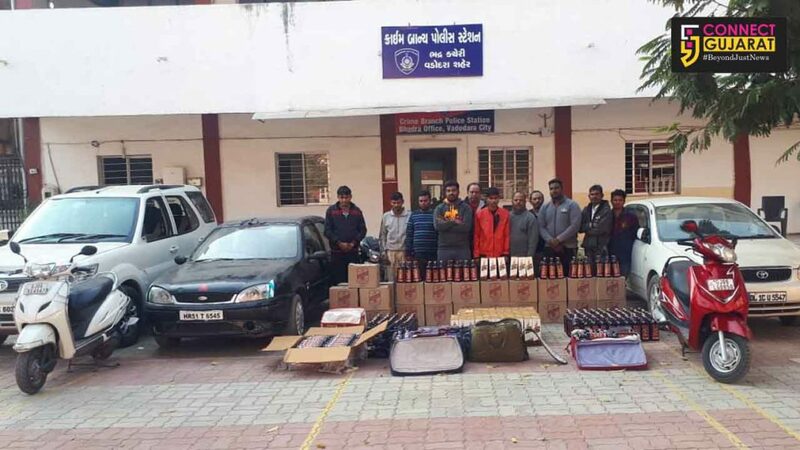 The police received the information about the bootlegger from Manjalpur Vijaysinh Rana brought liquor in Safari and cutting it near Divyajyot society hall. They caught Rana, Pramod Surve, Pravinsinh Tadvi, Raju Tadvi, Hitesh Solanki, Vinay Sharma, Sanjay Wagh along with three two wheelers, mobiles along with the liquor from the spot. During interrogation it was revealed that Vijaysinh Rana is in contact with one Dheeraj Kumar Sharma in Haryana and his men brought the liquor stocked inside three four wheelers loaded inside closed truck trailer here in Vadodara. They off load the vehicles and two was kept by Vijay himself. The team rhen reached the Tarsali bypass and found the container and the accused from Haryana Dheeraj Sharma from there. They also arrested the driver Jitendra Sharma and cleaner Sunil Kumar both residents of Haryana from there. Interrogation of Dheeraj Sharma revealed that out of the three vehicles they brought in the trailer two were kept by Vijay Rana and one was given to Lacchiram Kushwaha. While investigation the spot at Tarsali the team get to know about Kushwaha along with his associate Ashok Mali off load the needed stock and back with the four boxes to return the vehicle. He and his associate was caught by the police there with the car in addition to the Safari caught earlier from Vijay Rana. Asking about the other Ford Ikon car loaded with liquor the police get to know about one of his associate named Shivu went to deliver the cut to the customers and presently the car was parked behind Nand Residency at Makarpura. The team recovered the car from the described spot along with the liquor kept inside. The team also recovered the liquor from a house stocked by Lachhiram Kushwaha. The crime branch team arrested a total of 12 accused along with 911 bottles, trailer, three four wheelers, three two wheelers, 11 mobiles, cash all total of 32.9lakhs from them. All of them are booked under prohibition act in Manjalpur police station.